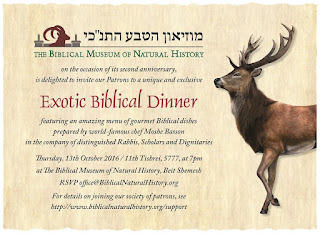 Rationalist Judaism: Exotic Biblical Dinner! A special announcement from The Biblical Museum of Natural History! On the occasion of our second anniversary, we are delighted to invite our Patrons to a unique and exclusive Exotic Biblical Dinner, featuring an amazing menu of gourmet Biblical dishes, in the company of distinguished rabbis, scholars and dignitaries! The dinner is being prepared by the famous chef Moshe Basson, known as “Israel’s Biblical chef.” The menu will feature wild animals, birds and other dishes that are mentioned in the Bible, with presentations by museum director Rabbi Dr. Natan Slifkin, Rabbi Dr. Ari Zivotofsky, and other scholars and dignitaries. The dinner will take place in the museum’s main hall (which will be modified for the occasion), providing a truly unique setting for this extraordinary experience! There is an extremely limited number of spaces available for this elaborate and exclusive event. Invitations are limited to patrons of the museum. To find out more about joining the museum family as a patron, and supporting our education programs, click here. The dinner will take place on Thursday, 13th October 2016 / 11th Tishrei, 5777, at 7pm. For more details, write to office@BiblicalNaturalHistory.org. I attended the previous version of this, held in Jerusalem, as well as one in New York. (The former served grasshoppers* while the latter didn't. I believe there was an even earlier one in Jerusalem and one in LA as well.) A third time is a bit rich for my purse, but highly recommended if you can make it. *Considering how much I paid, I told myself I'd eat everything. So I had grasshoppers, swordfish, udder, Rocky Mountain oysters (look them up), some amazing fish and fowl, and lots of other exotic, if less controversial, things. 1) The previous dinners emphasized the mesorah on all kinds of different birds and creatures. This dinner's emphasis is specifically on Biblical creatures and foods. 2) This dinner is being held in the museum, not at a restaurant. 3) This dinner is functioning as a fundraiser for the museum, hence the much higher price! 4) Because it is a museum event, we will be hosting dignitaries. Well, unless I become a "dignitary" fast...but hatzlacha! did you throw up after your last meal ?and anything you advise to avoid this time around? "we are delighted to invite our patrons" Lets call a spade a spade. Do you mean the guys you go to schnorrering, to give up their hard earned money to support an institution researching grasshoppers? C'mon Nosson, if that's your interest in life that's fine, but then don't keep on with your obsessive posting on people who have other interests in life, like studying Torah, who also find their "patrons" to part with their money. But how could I forget Nossons classic response: "My research into grasshoppers and anteaters benefits the Jewish nation as opposed to those studying Talmud & Shulchan Oruch." We are not raising funds to sponsor my studies. We are raising funds for a museum that educates tens of thousands of people. Do you really not see the difference? 1. It was all private money. 2. It didn't impact the kids' lives or life choices. 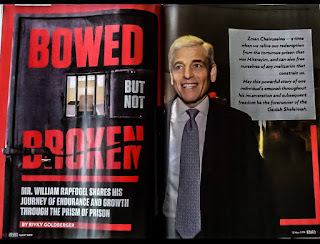 Like when RAL zt"l wrote that those rabbis who deride secular culture are often those who have no experience of it so too Fred here might well have little experience of either education or even museums and their respective benefits. Is this what we're expected to break our fast on?